Answers to all of the common questions about lab diamonds. Topics include: price, quality, resale value, time to grow, detection, appraisals, & insurance. 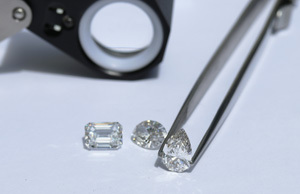 A purchase of jewelry from Ada Diamonds is directly supporting the development of high tech applications of diamonds such as laser lenses, surgical knives, faster charging electric vehicles, water purification devices, high pressure anvils, semi-conductors, and more. The short answer is that the mined diamond industry fears the coming disruption of laboratory grown diamonds. Unlike the taxi lobby and the hotel lobby, the diamond lobby has worked preemptively to fight the coming disruption, doing everything possible to stymie the growth of cultured diamonds. Get inspired by our collection designs and create a one of a kind bespoke ring with conflict-free, lab created diamonds. From boardroom to ballroom, create the perfect piece of conflict-free diamond jewelry to add elegance to any occasion. Unrivaled service, guaranteed to delight. Learn more about our bespoke design process.